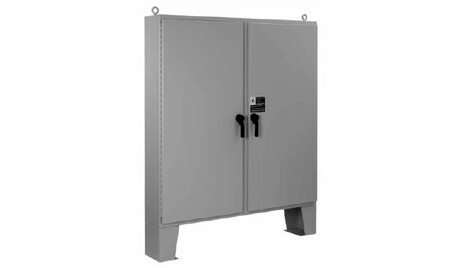 These enclosures are ideal for indoor or outdoor applications where it is necessary to protect controls and instrumentation from wet, non-corrosive environments. The design features Hoffman’s exclusive POWERGLIDE™ Handle with 3-point latching for secure closure and floor stands that provide additional height and access for cleaning under the enclosure. Download the Two-Door with 3-Point Latches and Floor Stands, Type 4 spec sheet below or call 714.835.6211 for more information.